If you love hosting get-togethers at home, we’re sure you’re familiar with the frenzy involved—from finalizing the menu and doing the groceries, to prepping the dinnerware and setting up the table. While we all look forward to spending time with friends and indulging in good food, giving the table setting a little extra thought can make the gathering more memorable and IG-worthy, too. 1. A white table runner or a set of white cloth placemats can make dainty dinnerware stand out. This charming setup is perfect for hearty breakfasts and tea parties. Add a sweet touch to your setting by bringing out your essentials in pastel colors. For an Alice in Wonderland-inspired gathering, choose saucers and teacups with floral prints. Some of the colors you can incorporate include—pink, baby blue, teal, and pops of fuchsia. RL Tip: Looking for a centerpiece? Fix the pastries and sweet treats in a pretty tray or cake stand, then place it in the middle of the table. You can add mini cupcakes with colorful frosting to give it an extra oomph. Find a similar tea service at Rustan's Makati. Get a similar cake stand with cover from Crate & Barrel. 2. Achieve a summer-inspired setting with bright and refreshing colors. Hosting a formal dinner with loved ones and special guests? Bring out your ornate plates and make them shine. For a cozy and sophisticated setup, use green and orange as dominant colors. 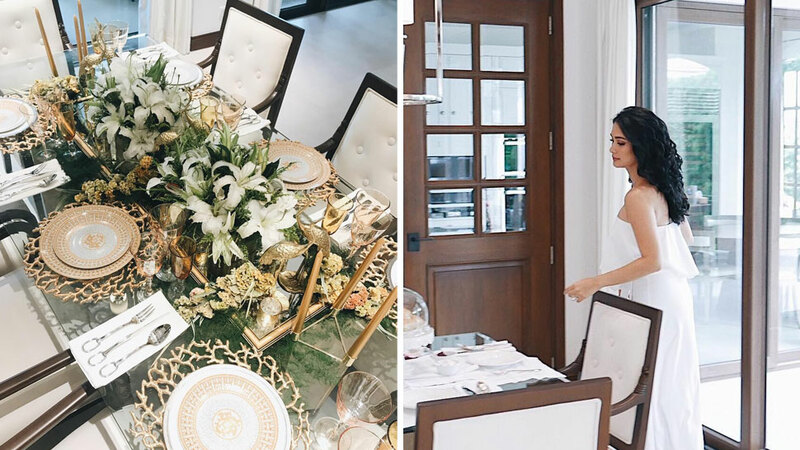 Take your cue from the setup done by Heart's cousin, Happy Ongpauco-Tiu—keep the look stylish with clear champagne flutes, wine glasses, silver flatware, and plates with intricate designs. Heart's plates—a balance of European and Asian-inspired details—are from Seletti. RL Tip: The centerpiece above is peg-worthy! Get creative with your succulents and pair these with fresh blooms for a refreshing setup. Find plates by Seletti at Dimensione, Unit 901, Quadrant 5, 9th Avenue, Bonifacio Global City, Taguig. Click here to visit Seletti's website. 3. Hints of gold and white can bring simple dinners to the next level. Recreate the vibe of a posh restaurant by working with touches of gold. Pair it with white table napkins and plates for a timeless combo that's incomparable. For an intimate setup, spruce up the table with golden candles, vintage-inspired candleholders and fresh blooms as centerpiece. Fix white roses and hydrangeas in clear vases or use small planters that match your table. Surround your blooms with accessories in gold for a cohesive look. Find a similar golden coral plate charger at Haute Home Manila. Shop for gold china (look for the Noritake Goldfleur pattern) at Rustan's. 4. Color-coordinated pieces make for an unforgettable table setting. While mixing and matching shades is fun, sticking to one dominant color can make it easier for you to set up the table. Choose your color and revolve the look around it. Take inspiration from a recent table setting on Heart's feed (also by her cousin)—blue is the main color, while white breaks the monotony of the entire setup. Since the pieces have patterns and some of the bowls and glasses are in solid blue, the setting doesn't look flat and boring. RL Tip: Inject hints of white through flowers as the focal point of the centerpiece. You can also work with white table napkins and place cards. Find a similar blue-and-white dinnerware at a11, 2680 F.B. Harrison Street, Pasay City. 5. Keep it simple and classy with a few patterns. A weekday dinner can be extra chic with spellbinding dinnerware and a blooming centerpiece. Even if there's no special occasion, transform the dining area with your favorite plates, chosen glasses, and a bouquet of flowers. Heart's table setting features cobalt blue glasses and stemware, plus dinnerware with a Marchesa Midnight Blue by Lenox pattern. The touches of blue work well with the striking red blooms she has chosen as centerpiece. RL Tip: If you're following the table setting above, inject hints of white to keep it from looking over-the-top. Find similar glasses and dinnerware at Rustan's. Bonus tip: Setting up the table for dinners and parties can be easier with an organized storage room or kitchen cabinet. Heart's storage room is neat and organized—with the plates, appliances, tea sets—kept in shelves. To make it easier for you to find what you need, group the dinnerware by color or design. You can also keep the plates together, then allocate a space for bowls, glasses, and the like.